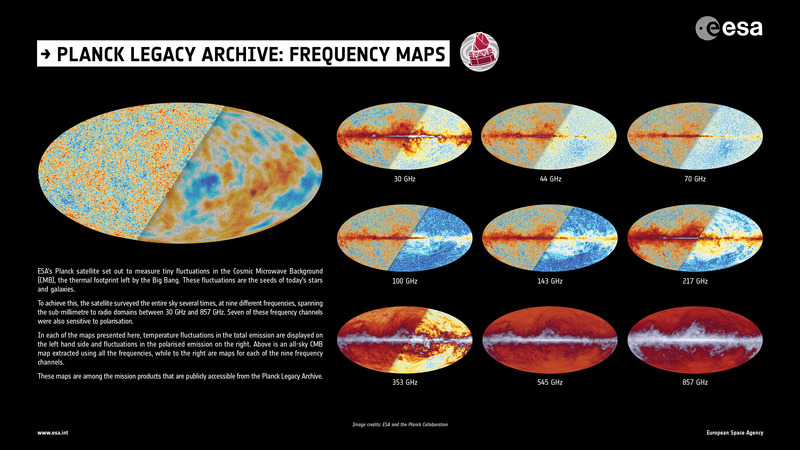 This infographic shows some of the maps that are publicly accessible from the Planck Legacy Archive. ESA’s Planck satellite set out to measure tiny fluctuations in the Cosmic Microwave Background (CMB), the thermal footprint left by the Big Bang. These fluctuations are the seeds of today's stars and galaxies. To achieve this, the satellite surveyed the entire sky several times, at nine different frequencies, spanning the sub-millimetre to radio domains between 30 GHz and 857 GHz. Seven of these frequency channels were also sensitive to polarisation. In each of the maps presented here, temperature fluctuations in the total emission are displayed on the left hand side and fluctuations in the polarised emission on the right. The large map is an all-sky CMB map extracted using all the frequencies, while to the right are maps for each of the nine frequency channels. A larger version is available from the right-hand menu.